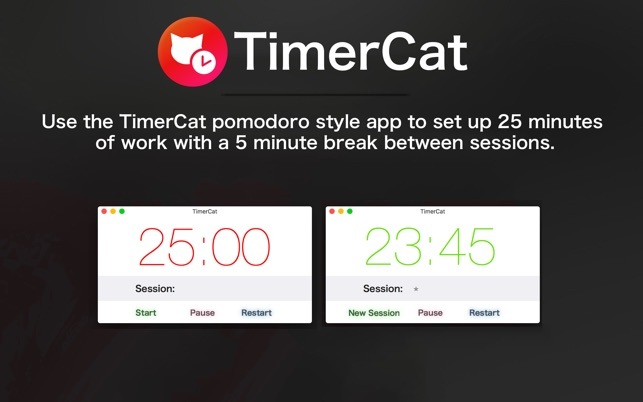 TimerCat is a pomodoro style productivity timer, use it to set up 25 minutes of work with a 5 minute break between sessions. A timer app that doesn’t accurately keep track of time. The 25 min countdown seemed way too long, so I ran a timer on my iPhone for the last 3 minutes and 6:45 later, TimerCat said that the countdown was over. I thought something was strange when I would start this timer and when checking in later, it seemed like almost no time had passed. I thought I was just “deep in thought” but I tested it with another timer to officially find out that THIS DOES NOT ACCURATELY COUNT DOWN! I set a 10 minute timer on my phone while the Timercat was counting down from 15 minutes. My phone timer went off and Timercat was only at 13 minutes 28 seconds. All the updates this app keeps doing, but they don’t actually fix the time keeping problem.